Travelling through the Labrador interior in 1839, Hudson's Bay employee John MacLean became one of the first white people to explore the Hamilton River. Over 130 years later it was to become the site of one of Newfoundland and Labrador's largest hydro electric projects. In 1894 Albert Low of the Dominion Geological Survey was the first to predict that the Hamilton Falls could yield several million watts of horse power (electricity). In Labrador to examine iron-ore deposits Low was enthusiastic about the potential hydro development in Newfoundland. It was not until the late 1890s that the transforming power of hydro-electricity was realized. While early uses of hydro power dated to the 1890s in Canada, it was not until the developments of the Niagara River in Ontario and the St. Maurice River in Quebec in the first decade of the 20th century that the modern industry was born. The economic development of Labrador did not take place until the discovery of large iron ore deposits in western Labrador and north-eastern Quebec in the early 1950s, which followed the building of the Goose Bay air force base during the 1940s. The first power station in Labrador was built in 1954 on Menihek Lake to meet the needs of the Iron Ore Company at its Schefferville, Quebec mine. Labrador's second hydro-generating station was built in early 1960s on the Unknown River at Twin Falls to meet the needs of iron ore mines in Labrador City and Wabush. All of these hydro projects were built by private companies to meet the needs of other resource development projects. Not until the mid-1960s with the formation of the Newfoundland and Labrador Power Commission - later renamed Newfoundland and Labrador Hydro -- did the Newfoundland government become an active participant in hydro development. This is the first hydro-generating station in Labrador, built in 1954 to meet the needs of the iron-ore mine in Schefferville, Quebec. Reproduced by permission of the Iron ore Company of Canada. From Iron Ore Company of Canada, Quebec -	Labrador/Iron Ore Company of Canada (The Co., ©1954) 15. The idea of developing Labrador's water resources dated back to the early 20th century. 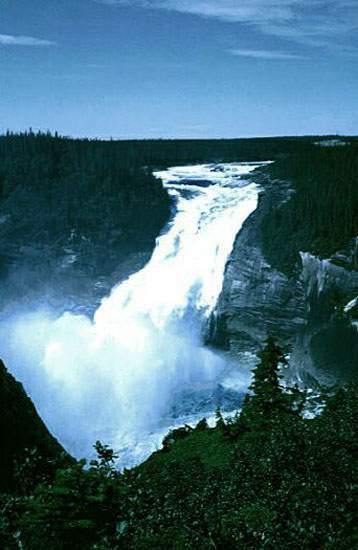 The first formal proposal to develop Hamilton Falls (later renamed Churchill Falls) was formulated in 1907 but the expense, the isolated nature of the site, and technological barriers stalled the project. In 1915 a French-Canadian engineer, Wilfred Thibaudeau surveyed the Labrador Plateau, and recommended that a "Channel Scheme" be used to divert the water from the river before it arrived at the falls, and return it back to the river below the falls to obtain as much height as possible. As the Labrador Plateau formed a natural basin this scheme would negate the need to build a large concrete dam to hold the water. Nothing came of this idea until 1942, when the Aluminium Company of Canada (Alcan) seized on Thibaudeau's idea to develop the river's energy capabilities. The amount of power that can be generated from a hydro-electric plant depends on the volume of water available to turn the turbines and on how far the water falls - the head -- before it hit the turbines. Alcan's proposal was deemed too expensive as there was no cheap way to transport workers and materials into the site, and no way to efficiently transmit the electricity out of Labrador to the nearest power grid. In 1947, a preliminary survey of the Hamilton River and the falls was carried out for the Commission of Government. Development of Labrador's hydro resources was made possible by the construction of the Quebec North Shore and Labrador Railway, completed in 1954, which gave the access needed for shipping in equipment and materials, and shipping out raw resources. Other factors which helped contribute to the decision to develop Hamilton Falls in the 1960s were improvements in technology, which allowed transmission lines to carry more power greater distances, and improvements in construction methods which allowed the site to be developed at a more reasonable cost. 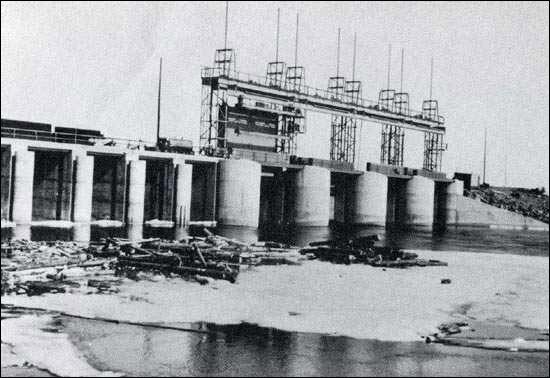 Once a buyer was found for the power - Hydro-Quebec - which in itself took years, the project broke ground in 1966. At the time it was the largest construction project in North America, employing thousands of workers over its seven-year construction period, with 6200 employed at its peak. Water from the rapids above the falls, and water diverted from the Churchill Falls, provide the energy for the massive hydro-electric project. Water diverted from the falls and water from the rapids above the falls provide the energy for the Churchill Falls hydro-electric plant, which completed construction in 1974. Reproduced by permission of the Geological Survey of Canada, Natural Resources Canada, ©1998. The heart of the hydro-generating power plant is the 5,428,500 kilowatt underground power station. Soon after the 1974 completion of the Churchill Falls project, the Newfoundland government purchased controlling interest in the CFLCo, the parent company which controlled the hydro project.